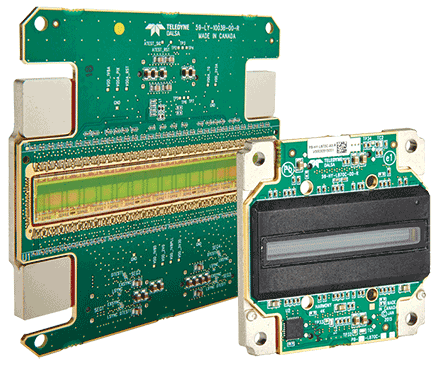 WATERLOO, Ontario, June 2, 2017 — Teledyne Dalsa Inc. has announced CMOS line-scan image sensors in resolutions from 2 to 16k. Features include fast line rates with data throughput up to 1.1 Gpix/s for improved productivity allowing faster scanning in less time; true color imaging with three-line RGB, four-line RGB/NIR and bilinear subsampled color; and a common interface with common pinouts, data interfaces, control interfaces and mechanical connectivity that enable easier design-in for multiple sensor solutions. Multiline scan with independent exposure control provides the ability to control the amount of light hitting every line and enables dynamic white balancing with flexible lighting for advanced defect detection. The sensors are vertically integrated, turnkey solutions including a single manufacturing path from wafer probe to packaged part test.